After soaking the pellets in water for about thirty minutes we began to carefully take them apart using tweezers and paperclips. The pellets were quite heavily compacted and pulling the matted fur apart without breaking brittle bones was a little challenging. We each found either three or four skulls per pellet, with one small pellet containing just a single skull and body. All of the bodies that we recovered were Field Voles, with the exception of a tiny Pygmy Shrew. The Field Voles were identified by the zigzag pattern of the teeth, and deep grooves running down the teeth and into the jaw. The Pygmy Shrew jaw bone was just 13mm long, and was identified by the red colouring, and the four small cusps evenly spaced on the end tooth. 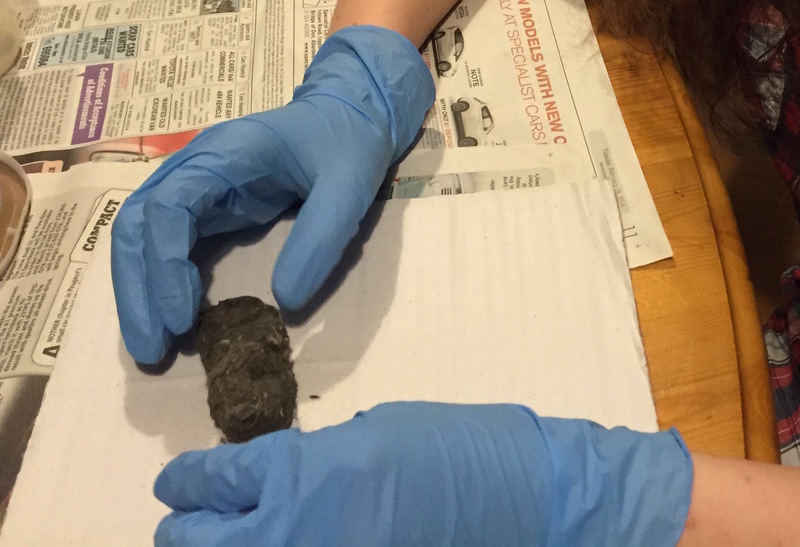 Dissecting the Owl pellets was an interesting activity, and probably something that would be fun to do with kids. This handy guide helps you with dissecting, and indentiying the various bones that you'll recover.